Compiere lets you automate all of your financial, distribution, sales and service processes quickly and easily. At the same time, Compiere employs an innovative model-driven Architecture that gives you unprecedented adaptability, speed of deployment and low cost of ownership. The Compiere Model-driven Application Platform, depicted above, is composed of an Applications Dictionary, a Transaction Engine and a Transaction Database. The Applications Dictionary is the repository of business logic meta-data such as window, field, report and workflow definitions. The Transaction Database is the repository for your transaction (e.g. invoices) and set-up (e.g. customer) data. 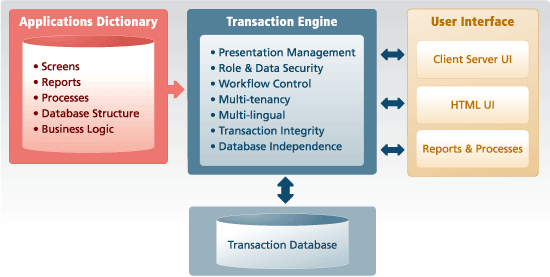 The Transaction Engine manages the interplay between business logic from the Applications Dictionary, transaction data from the Transaction Database and user requests. The significant breakthrough in the Compiere Model-driven Platform is that it stores business logic in an applications dictionary rather than being hard-coded into software programs. At runtime, The Compiere Transaction Engine reads and writes information from the applications dictionary and the transactions database, utilizes the business logic to assemble windows and data and present the results to the user. With business logic stored in the Applications Dictionary as rows in the Compiere database schema, customizing the application is a simple matter of creating, modifying or deleting business logic in the Applications Dictionary. System administrators use the Compiere client to access and change the business logic in the Applications Dictionary, typically without programming. Once saved, Applications Dictionary changes are available immediately to the Transaction Engine and for user transactions. What's more, storing business logic separately from the Compiere executables enables you to ensure that your business-specific optimizations remain in place over the lifetime of your solution, even through upgrades to newer versions of Compiere software. Unlike traditional ERP systems that recommend adapting your business processes to match the default software settings, Compiere encourages you to customize the solution you deploy to match your business needs. As your business environment changes, you can adapt Compiere to your changing needs–quickly and easily.